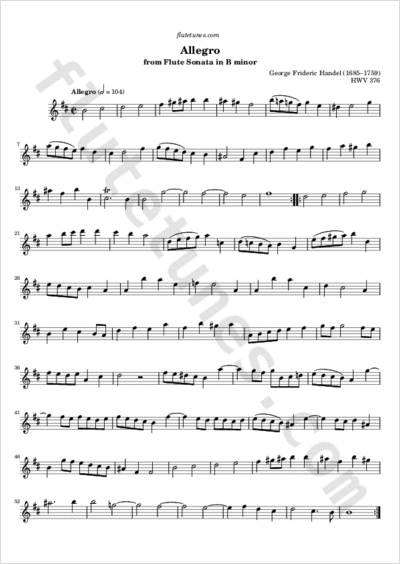 This Allegro is the second movement of a sonata in B minor for flute and keyboard that is thought to have been composed by George Frideric Handel. First published in 1730, the sonata is referred to as Halle Sonata No. 3 (“Hallenser Sonate Nr. 3” in German). Its authenticity is uncertain; in fact, of the three “Halle” sonatas, it is the best candidate for not having been composed by Handel, although if it wasn't, it is an extremely good imitation of his style.